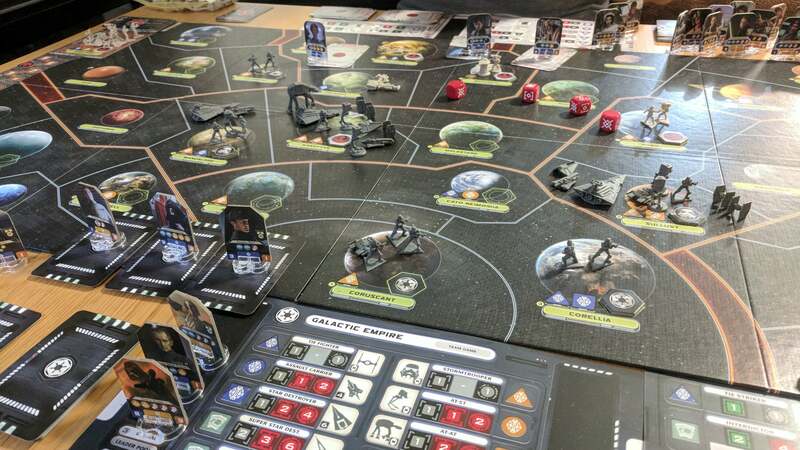 Star Wars Rebellion is an excellent board game that manages to capture the feel of the entire classic trilogy inside a single tabletop experience. Rise of the Empire is a new expansion for the game that does the same thing, only for Rogue One. If you're new to Rebellion, here's a quick intro: it's a big-arse board game that pits the Empire against the Alliance. It's fought on two levels: players are able to send individual hero units like Darth Vader and Luke Skywalker on important missions behind enemy lines, but at the same time you're also in control of large military forces that do battle on a strategic level, ala Risk. The base game, released in 2016, included only units and characters from Episodes IV-VI. 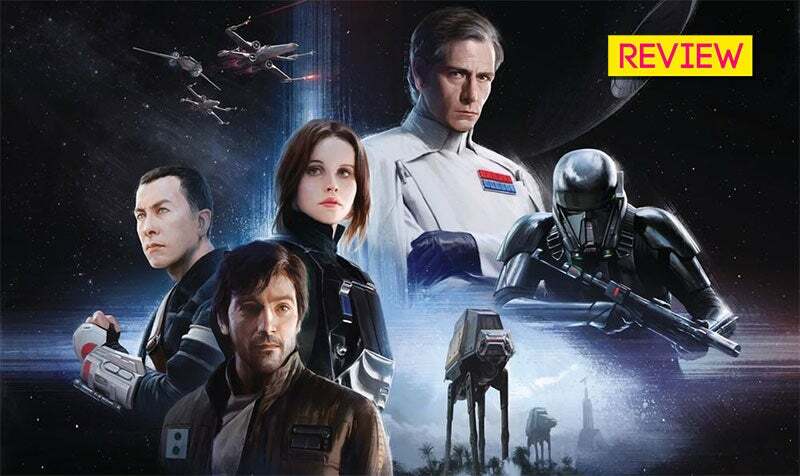 Rise of the Empire expands this by not just adding the heroes and villains from Rogue One, but altering a few of the game's rules and starting provisions to better match the tone and story of the prequel film. The full game at a glance. 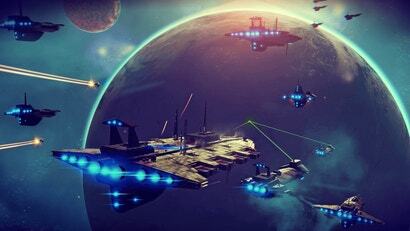 Squint and you'll be able to make out some of the new units, like TIE Strikers. Rebellion felt like classic Star Wars because both faction's strengths (and weaknesses) played to those present in the films. Playing as the Alliance meant living in constant fear of being wiped out in an instant by superior forces, and most of your time was spent running covert missions and shuffling your small fleet around. Playing as the Empire, meanwhile, meant the luxury of being able to win most military encounters at ease, but also the quietly-building stress that the more you tightened your grip, the more systems slipped through your fingers. That split doesn't work here. The Alliance of Rogue One is nowhere near as powerful as it is by Return of the Jedi, and neither is the Empire for that matter, so this expansion's most immediately noticeable tactic is to nerf both side's starting military forces. 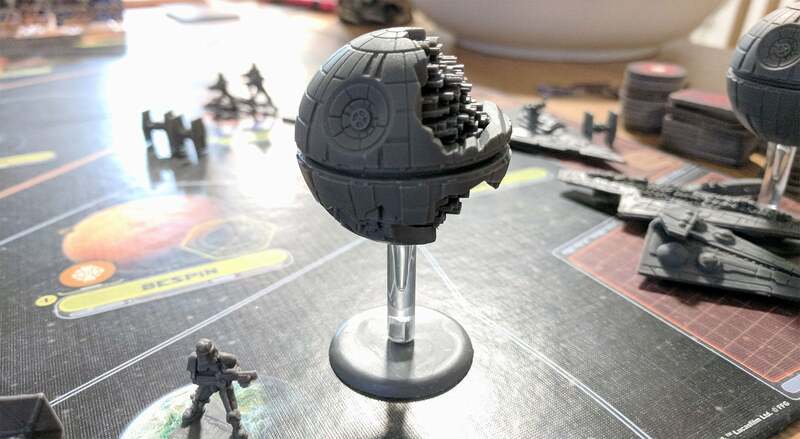 The Empire's Death Star is still under construction for a number of turns, for instance, and the Rebel's fleet is smaller than that found in the base game. Making up for the relative weakness of your starting fleets and armies are cooler and more interesting options for leader missions, again matching the story of Rogue One. 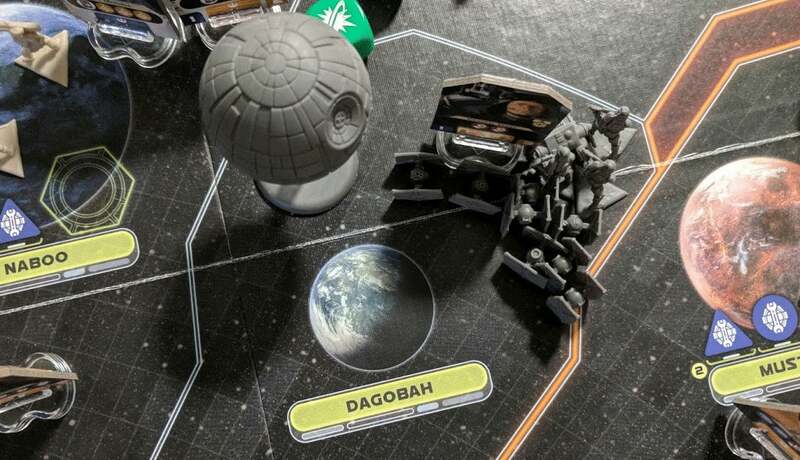 New target markers (cardboard tokens placed literally on the map) add an extra layer of action to some, while both sides will enjoy some drastic and well-written options like being able to feed Rebel leaders to the Sarlacc (Jabba is one of the new Imperial characters). The ability to send multiple leaders on a mission then psyche out an opponent and return them to your pool can also make planning a blast/nightmare. Rise of the Empire isn't a standalone experience, it slides into Rebellion by simply adding its cards and characters to the existing roster. And while it's recommended for your first playthrough that you only use the new cards — meaning you're essentially recreating much of the story of Rogue One — once you've got the hang of things there's nothing stopping you from simply playing a regular game of Rebellion with most of the new stuff added, increasing the scope of the game from three films to four. This makes the game slightly messier, since there's added player cards needed to accommodate the new units, but for the most part that's a welcome addition. New ground units, for example, use the new green dice rather than red or black, making for less certain — but more powerful when paired with the right tactics card — outcomes. Which is all nice and fun, but the biggest thing Rebellion sets out to accomplish is to address the entire combat system from the base game. Which sucked. It was boring and time-consuming, so with the expansion Fantasy Flight have almost completely overhauled it, introducing a whole new deck of tactics cards to replace those found in the original. They call it "cinematic combat", and it makes outcomes far more reliant on the cards used rather than the dice rolled. It's an improvement, and can cause a few upsets when the right cards are used, but I'm not as excited about it as other experienced players seem to be. It's still fiddly and time-consuming, especially during larger battles where damage needs to be tracked, and I've found that playing as the Empire in late-game scenarios I was simply skipping battles altogether because I couldn't stand the drag of it. Some of the new leaders, units and cards available in Rise of the Empire. 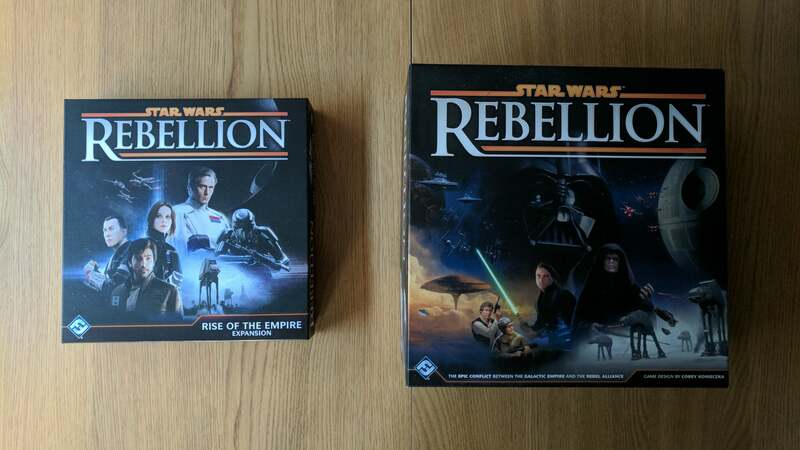 Rebellion was already a fantastic board game experience, able to at once capture both the personal heroism and the strategic struggles of the Star Wars trilogy. Rise of the Empire does to the game what Rogue One did to the movies: adds to their story and fleshes out the experience while managing to be a good time all of its own. Great overview. Haven’t played the expansion but love the base game. 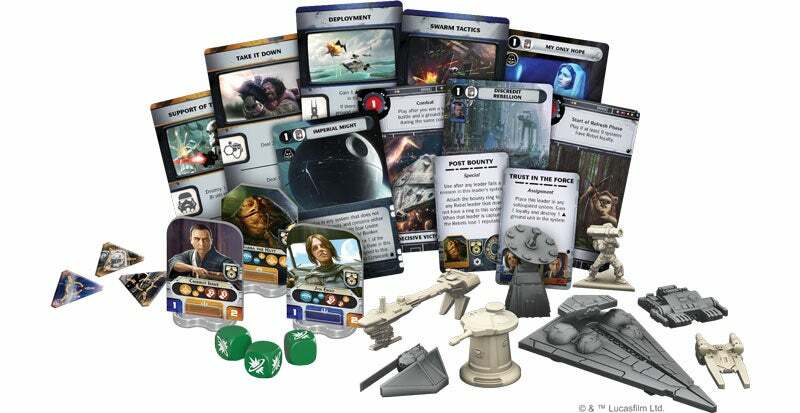 Is it actually detailed in the rule book you can mix up all the cards from expansion and base to expand across from the original trilogy to rogue one or is that just a house rule you can play with? Have to say, first few games absolutely hated combat and it seemed to grind any momentum the game had to a halt every time you had to battle. But the more I play the more I have started to enjoy combat and now we almost look forward to it. It’s still probably the weakest part of the game but it’s not as bad as it’s made out to be.